Every night I stayed awake beside her until the early morning. I made sure she was safe and comfortable and, most importantly, drugged. I read Evening Prayer to myself, then kept vigil after she fell asleep. Every once in a while I’d glance over to watch her breathe. On my right side, her body. On my left, a stack of boxes, my makeshift bedside table, its surface strewn with candy, cards, trash I was too tired to throw away. Straight ahead, somber dark reflections in the dresser mirror. Beside the bed was a clear plastic box. It was packed tight with little bottles of morphine. The tablets were very small, and each had a different color: white, green, orange, blue. The nights passed very slowly. Our house in the city – the house we’d fled – sits between two streetlamps. At night you can wake and see the yellow pouring and glowing on the neighbors’ houses. Headlights pass, and lull me to sleep. But in the country, between two and three in the morning, the only light came from the icicle lights I’d draped beside the bed. The only sound came from the artificially hot air passing through the vent. There was a clunk when its cycle ended. I hated it. I hated all of it. I hated feeling like I was the only person left. I hated leaning forward and pulling the heavy curtain back and seeing nothing but black snow and starry pinpricks, obscured now by trees. I would have screamed, but no one would have heard me. So I listened to music with my worn-out headphones. I listened to The Staves and Justin Vernon. Before I fell asleep that night, I shared the video of Make It Holy with my Facebook friends, appending a question: Why does this touch me so deeply? It was too late for anyone to answer. And that was the last night I had to keep vigil. The Staves are three British sisters, tall and fine-boned and long, with long silky chocolate hair. They sing, and they are famous the world over for their chillworthy harmonies. They recorded their latest album, If I Was, at Justin Vernon’s studio, which is a little more than a dozen miles down the road from my family’s farmhouse. All winter long, I watched this mini documentary again and again. The pretty girls with the pretty accents laughed and shrieked and chased each other through a yard of snow, their necks wrapped in thick scarves. They seemed inspired by the isolation I was drowning in. I think this is my favorite place to be…to make music. It’s such a special place. It’s just magical. To have this space, and be surrounded by kind of nothing – a load of trees… It’s been really freeing, to actually have the time and the freedom to explore, and re-expand on sounds and lyrics and vibes of things. It feels like us kind of stretching out. It’s very much an album that’s been born from being away from home a lot, and being on tour. We had the bare bones of this song that we were playing around with, then we were just on the road for so long. The first time we went out to April Base, we kind of revisited it, and it turned out to be Blood I Bled. It just needed that time and space to grow into how it needed to be. 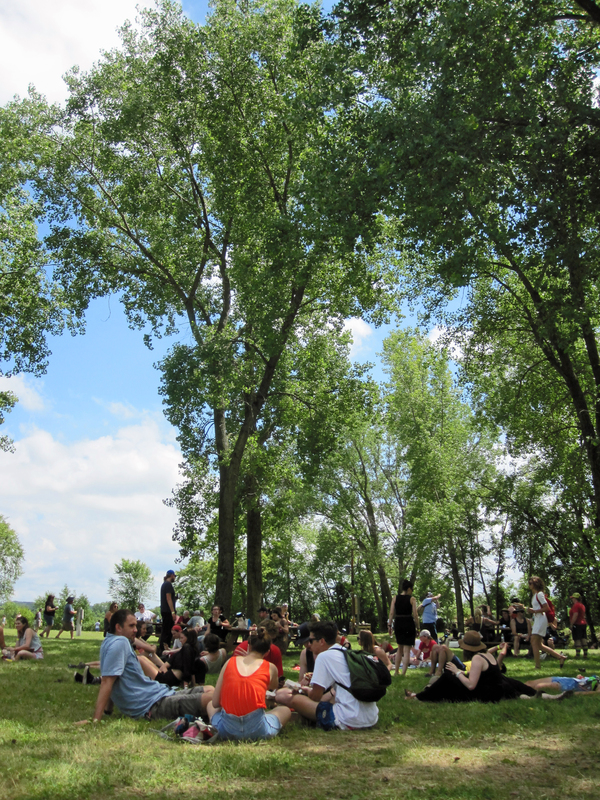 The inaugural Eaux Claires Festival took place in a field beside the Chippewa River. The grounds were on a road I’ve known since before I could see out a car window. 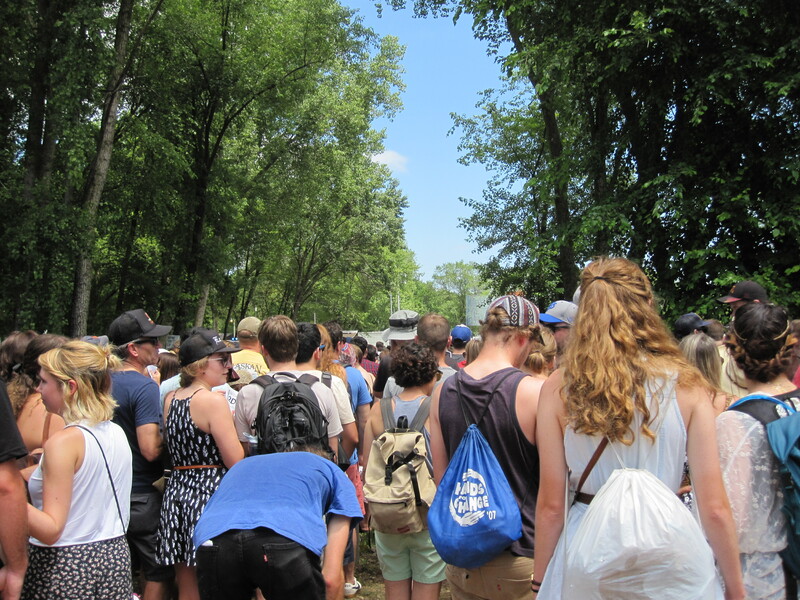 Because the road was rural and access difficult, most of the twenty-thousand-some attendees were asked to park in town and then ride a shuttle bus in. It was beyond strange to take a shuttle bus to a field so close to the family farm. It looked to be the same land I’d watched this winter, as we drove into town every day for radiation treatments, but now there were twenty thousand people here, and distant music thumping through the ground, and the sunsets came late, and there was laughter, and everything was green and alive and rustling in the wind, now. Was the winter a dream? Was this? Mid-July was hot and soupy and sweaty and the sun beat down. I waited an hour in line to get a wristband.The sun beat. No one seemed bothered by the delay. Occasionally an arm would stretch up from the crowd – I’d wonder why – then I’d realize the stretching arm was catching a breeze, and I’d turn my face toward the sun to catch it, too. I drifted beneath the first art installation that also served as entrance to the festival: thousands of pieces of yarn suspended in the air, gently sweeping, undulating. I bought an ice cold water from smiling staffers under a white tent. I sat down on the grass. I cracked the bottle open, and I drank. I watched the grounds. 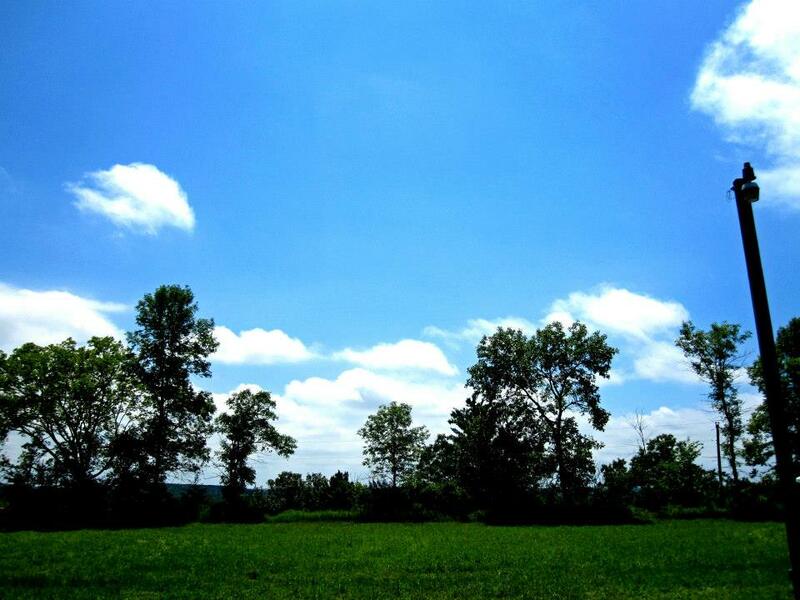 The sun beat, but my eyes were safe; I was under a wide-brimmed cream hat. My shoulders smelled like sunscreen. I wandered past a floral booth several times. Flower crowns were for sale. I was nudged by her memory to open my wallet. I’ve been so responsible, so safe, so careful since she died, but I felt the whisper of her voice in the wind. I handed over the wrinkled bills, then squealed with delight at the impractical beauty of live flowers on a hat. My mother loved impractical beauty, as long as it was honest. And flowers are honest. I’ve never actually been to an outdoor summer music festival before, but I felt at home at this one. It had the honest charm of a Midwestern county fair, with the artsy freewheeling busy-ness of the Stockholm Art Fair or my beloved Fresh Art Tour in the Mississippi bluffs. 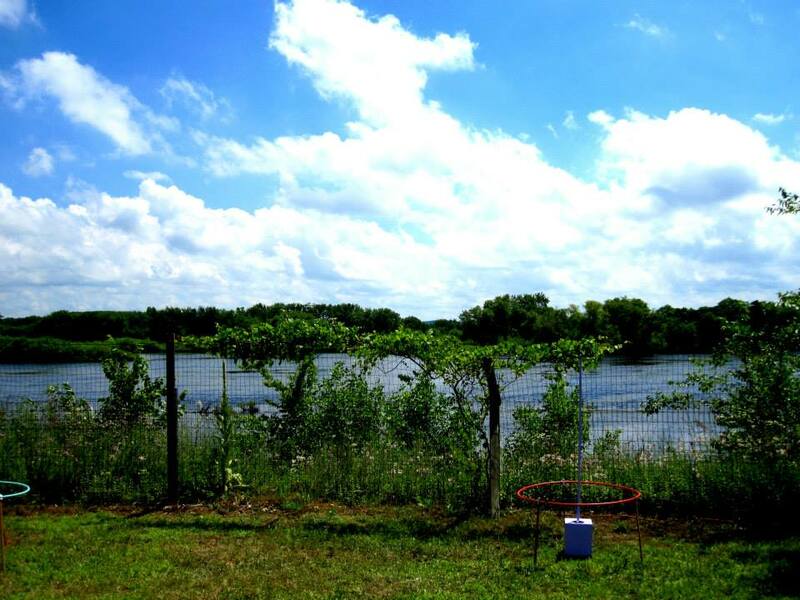 The Chippewa River rolled past the grounds like a thick gray snake. The sun beat, and some people climbed over the fence to scamper in the water. The clouds floated above like God-sized cottonballs. I didn’t stay on the grounds long enough to explore every art installation, but I did stop to observe one piece set on the banks of the river. It had a propeller, and it emitted a strange ethereal shrieking noise as the wind and water passed. 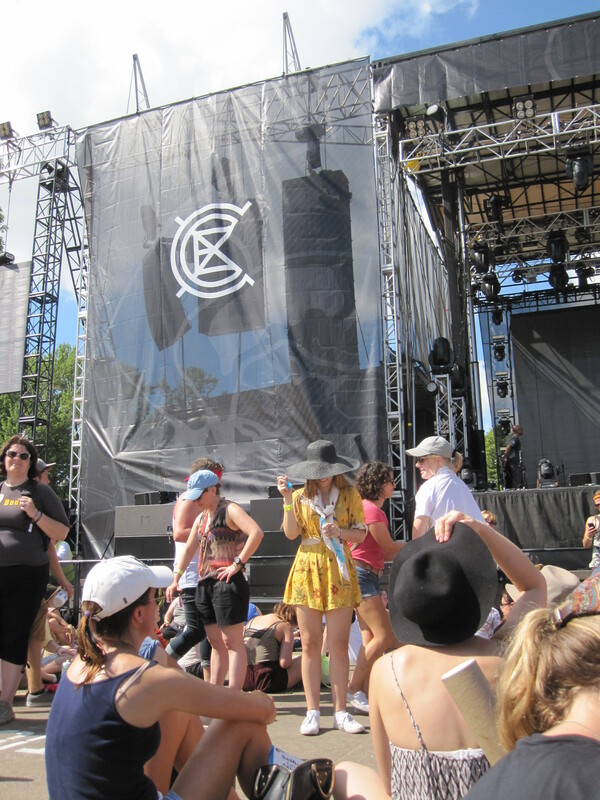 I staked out my Staves spot early: on the concrete, directly in front of one of the main stages. There were two stages on either side of the massive field, so while one band was sound-checking, the other would play across the way. There was never silence. The sun beat. I ate my hot fried cheese curds on the hot cement. I could see wide swaths of wet tan shoulders. I could feel my flower crown wilting. 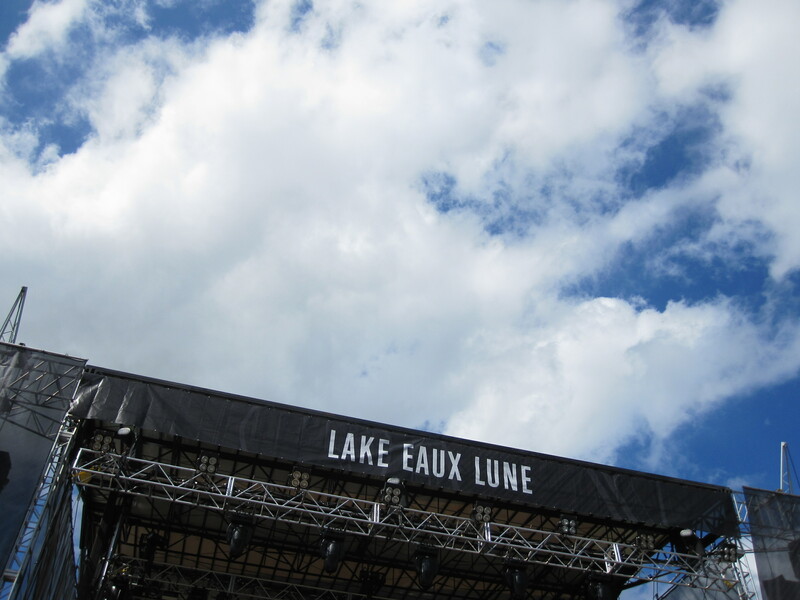 One young woman by the stage was wearing a sundress and white tennis shoes and blowing bubbles into the breeze. There was something so beautifully carefree about her: she was iconic. I felt joy in my throat as I took a picture of her. We’d all stumbled into a kind of sunny communal too-loud dream. I looked up into the sky. Then the Staves took the stage. And immediately there were little screams and gasps of pleasure throughout the crowd, reacting to this exquisite female voice flying across the meadow like a lark’s. 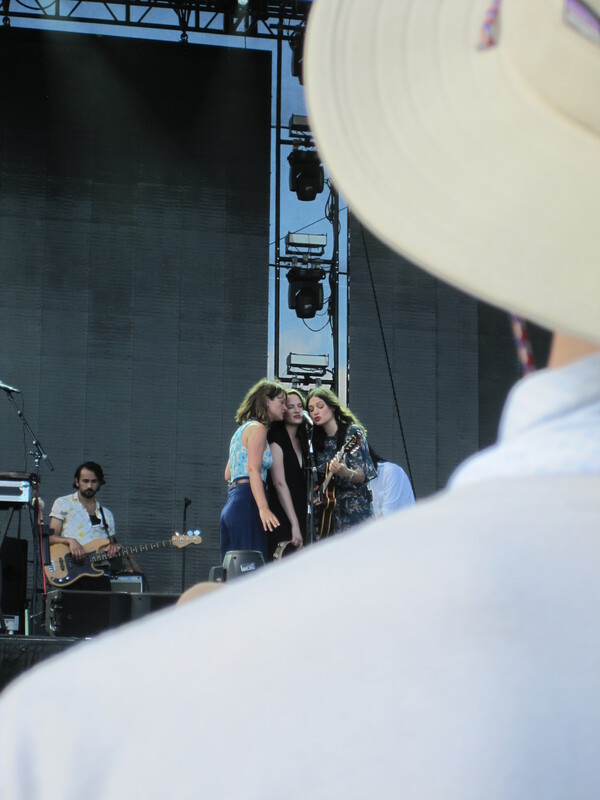 Before the set had started, a nearby hipster had been discussing the pros and cons of the venue, wondering if the sisters’ harmonies could possibly be captured in an open field. He immediately fell quiet. Emily pounded rhythm into a drum with savage intensity, her hand tightening into a fist, then relaxing out as the phrases sang forth. Jessica ooed harmonies into the mike, punctuating with sharp strums. Their long hair was brushed by the breeze. A ghostly harmony not on the recording alighted on the air, like feathers between our shoulder blades. There were screams again, and one of them was mine. There is something about the Staves’s spirit, their technique, their retro elegance, and most importantly, their harmonies that strike chords with me. Nothing about them is sloppy or haphazard or false. Everything is smart. More than one classical musician I know could learn from their artistic purity, their effortlessness of expression. I was surprised at how almost viciously satisfied I was to see men sidelined onstage. Men were in the back, yes, and they were providing fabulous drive and beat and backing, but they were never the stars. The women were. I wish I lived in a world where that thought didn’t cross my mind, where that happens so frequently it’s not worth noting, but I do, and it is. By the end of the set, I was leaning so far forward, mesmerized, that the remains of my cherry Icee slopped from my hand onto the concrete. Ten minutes later, after they were done and the crowd was reluctantly dispersing, I reached down to pick up the plastic cup. The sun had sucked it dry. Finally they came to Make It Holy. “A song born in Eau Claire,” Emily offered, and my brow wrinkled briefly. The phrase “born in Eau Claire” frustrates me and inspires me in equal measure. I thought I’d cry. But I didn’t. It has taken longer than it should have to acknowledge that a part of me broke this spring. Certain triggers that once triggered so much now trigger – nothing. My face stays blank, my heartbeat regular, as I think of being wrapped in my coat in the car, reaching out for her dry withering hand, during our black snowy journeys to Rochester. I can describe those nights with clinical detachment; I can describe the horror, but I don’t feel it anymore. So there will be no pang of teary healing as the Staveley-Taylors sing their chilly lullaby. Just an appreciation for their otherworldly beauty. A glowing respect. A raw, melting admiration. A silvery gratitude. I see the scab, maybe. But I won’t touch it. Exquisite . . . and holy. Thank you! Sometimes when people experience a traumatic experience, or a number of traumatic experiences, their minds can emotionally withdraw for a time. It’s not the end of emotion but rather the beginning of an emotional wintertime for which a springtime can and will come again. 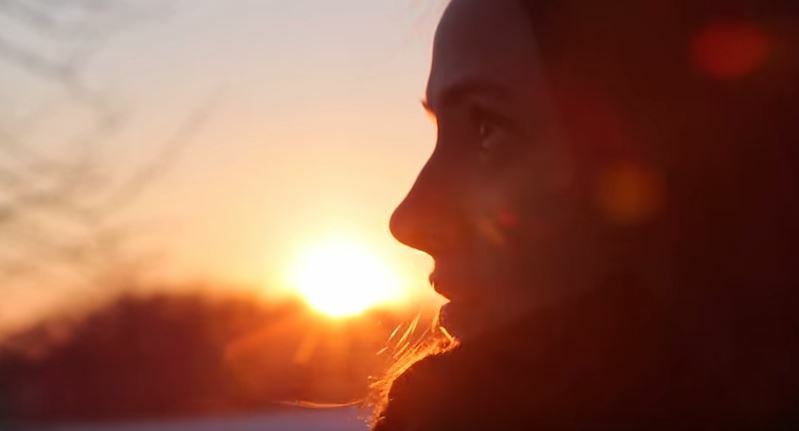 From personal experience (as I can not truly imagine the magnitude of that which you have gone through) that emotional wintertime can be deceptively rough. I found my own smile in my own patch of darkness. I know that sounds weird, until you understand what it meant to me. Simply defiance. It became the one thing that could never be taken from me. At least not for very long. I don’t just smile when I am happy, I smile when I know I am about to do something which I cannot possibly accomplish…. Hi Emily–I’ve had this post up on my browser for the longest time, hoping I could come up with some words equal to yours, to say how much I love & admire your sensibility and your writing. I may not read every morsel you write (although lately I have been), and when I do drop by, it always feels like ‘home’ somehow, like the center of the center of the universe suddenly shifts to what you see, feel, and write about. There’s so much in this post that resonates in me too, because it’s emotional territory I’ve passed through myself. This is the sweetest comment imaginable. Thank you.